Martin Yale BCS412 Flip Book Cutter The Martin Yale BCS412 Flip Book cuts a standard 8-1/2" x 11" sheet into 2" x 3-1/2" business cards in a two-pass operation. The BCS412 Flip Book Cutter. Ideal for cutting pictures, flips and covers. Customized to maximize your working efficiency. Includes two slitter blades, two slitter backups, two scoring blades and two scoring backups. Cuts 8 1/2" x 11" sheets into two strips of 3 1/2" x 8 1/2" on the first pass and finishes the job by taking the 4up sheets and cutting them down to 2" x 3 1/2" cards. Cutting blades are semi-self sharpening to allow for years of operation without sharpening or replacement. Adjustable paper guides allow for easy set up for customized needs. Continuous feeding of stacks up to 5/8 thick. 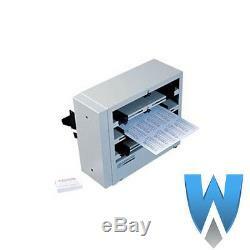 Creates up to 375 cards per minute. We always try to get equipment out in a timely manner. Customer Service We've been serving happy customers since 1945, and we want to serve you the best we can. Also be sure to visit our website! The item "Martin Yale BCS412 Flip Book Cutter" is in sale since Tuesday, October 14, 2014. This item is in the category "Business & Industrial\Printing & Graphic Arts\Bindery & Finishing Equipment\Paper Cutters & Trimmers". The seller is "whitakerbrothers" and is located in Rockville, Maryland.